Made from Acerola Cherries, (nothing added or taken away), this citrus-free wholefood vitamin C is easily absorbed, gentle on the stomach and only mildly acidic. Food State Vitamin C has been one of Nature`s Own best selling products for many years and is valued by many for its tremendous gentleness of action combined with superior effectiveness. It is one of the few vitamin C products on the market that is retained by the body, (and not rapidly excreted), so we can achieve benefit from the whole amount of vitamin C in the product. However, a few of you prefer to avoid citrus-based products, and it is for this reason we have decided to include another wholefood vitamin C product into our range, from a non-citrus source. 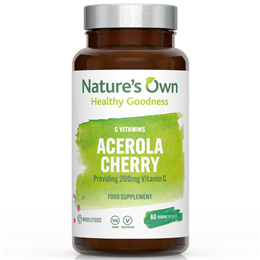 The fruit of the acerola cherry tree is rich in vitamin C and carotenoids, with the cherry-like fruits being one of the richest-known natural sources of vitamin C. Acerola also contains a whole array of bioflavonoids, vitamins, minerals and other phyto-nutrients, making it an ideal food-based source of nutrition. Whole acerola cherry powder, providing naturally occurring bioflavonoids, hydroxypropylmethylcellulose (capsule). Take 1-2 vegicaps daily, or as directed by a practitioner. 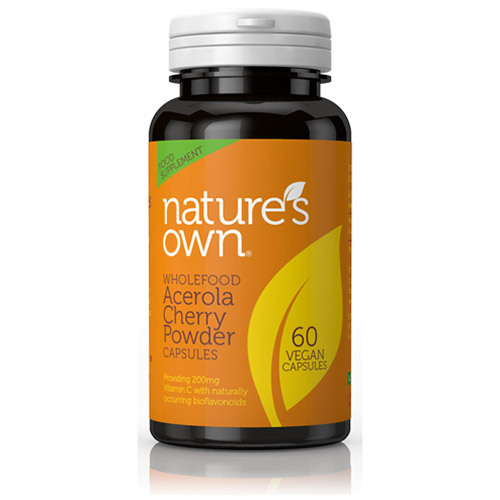 Below are reviews of Natures Own Wholefood Acerola Cherry Powder - 60 Vegicaps by bodykind customers. If you have tried this product we'd love to hear what you think so please leave a review. Cherry C very good product and would gladly recommend it. Made from Acerola Cherries with nothing added or taken away, this citrus-free wholefood vitamin C is easily absorbed, gentle on the stomach and only mildly acidic.